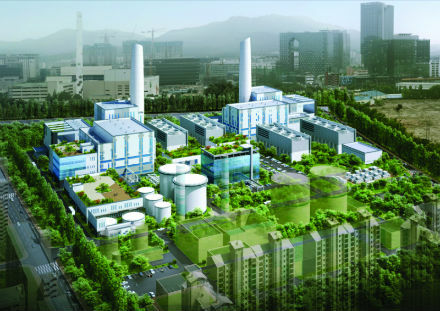 Commercial operation has been achieved at unit 2-1 of GS Power’s Anyang CHP district heating plant, which employs a GE 7HA.02 gas turbine, with heat recovery steam generator and GE D652 steam turbine. This was eight weeks earlier than scheduled thanks to the 7HA’s “innovative modular architecture and constructability”, claims GE. It is the first HA gas turbine delivered to and commercially operated in Korea. The same configuration will be employed for unit 2-2 at Anyang. The new units are replacing a 26 year old facility at the site. GE was relatively late into all-air-cooled heavy duty gas turbine technology, but has worked hard to make up for lost time. Its HA gas turbine currently holds both 50 Hz and 60 Hz combined cycle efficiency records, and has amassed over 118 000 operating hours, with 76 ordered so far, and 28 in commercial operation. Competitive Power Ventures (CPV) and its partner GE Energy Financial Services announced that the CPV Towantic Energy Center in Oxford, Connecticut, has achieved commercial operation. This 805 MWe plant uses two 7HA.01 gas turbines and associated engineered equipment package. The HA’s dual-fuel capability allows the turbines to run on a variety of fuels, bringing significant reliability benefits to the region. PSEG Power, a subsidiary of PSEG, has achieved commercial operation at its 540 MWe Sewaren 7 combined cycle power plant in New Jersey, powered by a 7HA.02 gas turbine and associated engineered equipment package. Tennessee Valley Authority’s Thomas H. Allen Fossil Plant in Memphis, Tennessee, as well as the Haveli Bahadur Shah and Bhikki power plants in Pakistan, also have recently achieved commercial operation. Work at the Porto de Sergipe power plant, in Barra dos Coqueiros, Brazil, is progressing with three 7HA.02 gas turbines and three generators arriving at the Sergipe port on 1 June. GE is supplying the entire power island engineered package as well as the remaining balance of plant such as cooling towers, foundations, roads and buildings. When complete, the plant—owned by Centrais Elétricas de Sergipe S.A. (CELSE)—will be capable of generating 1516 MWe, the largest gas power plant in the country. With an extensive amount of wind and hydro power in Brazil, “7HA technology will play an important role in enabling a quick response to fluctuations in grid demand and adapting rapidly to weather changes”, says GE.